We are trusted by consumers for providing Optical Radiation Pyrometer product. This pyrometer is best in finishing and show longer working life. Tempsens offers calibration of Non contact temperature sensors i.e. Infrared pyrometers traeceble to both national and international standards. Mahlo offers control and monitoring equipments with the aim to achieve high productivity, cost efficiency, resource allocation, consistent and repeatable quality with short lead times. Resolution: 0.1 up 1000 deg, 1over 1000 deg. We are involved in offering excellent quality Infrared Laser Pyrometre to our most valued clients. Our offered Infrared Laser Pyrometre is widely appreciated by our clients which are situated all round the nation. 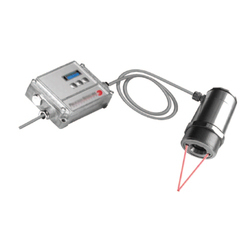 We offer Infrared Laser Pyrometre at most affordable prices. The Raytek CI noncontact infrared pyrometer is compact and easy to install. Designed for easy integration into a standard 4-wire system, the CI sensor can easily replace traditional contact probes with a J-type or K-type thermocouple output. Manufacturer of infrared radiation pyrometers, thermography cameras, black body radiator calibrators & mobile instruments. 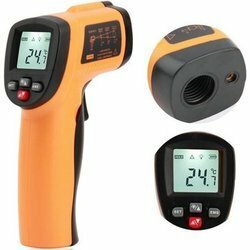 Infrared Thermometer measure the surface temperature of an object. It’s optics sense emitted, reflacted and transmitted energy which is collected & focused on a detector. It’s electronics translate information into a temperature reading which is displayed on the unit. - Temperature Range: 550 Deg C, 880 Deg C & 1050 Deg C.
Temperature meters operating in the infrared are used to determine the temperature of the surface of the item. The optical system of the device detects the emitted, bounced and sent energy, which is collected and concentrated on the detector. Electronic system translates optical data into temperature value. In order to increase accuracy the laser pointer is built-in the device.